But its different for Sylvi and Ebon. They can understand each other. They quickly grow close-so close that their bond becomes a threat to the status quo-and possibly to the future safety of their two nations. After reading this novel fully, I have to say that the plot was generally slow. The novel was packed with background information and history but there was little to no action until the last 25 pages of the book. Although it was a slower read for me, I felt captivated by the world and history McKinley built up between the Pegasi and humans. The ending of this first book nearly killed me. There's quite a cliffhanger that may make you want to throw the book against something, especially when the second book has no publication date yet. I will most likely have to reread this one before continuing on in what seems to be a promising series. Sylvi is an interesting princess and I felt that McKinley created her so well that you really knew her as a real life person and friend. Her pegasi counterpart Ebon was very humorous and I loved seeing the pair interact. Final Verdict: Fans of high fantasy will love this novel, as long as they can bear with the lack of action for most of the novel. Great review Kristen! I’ve had my eye on this book for a while. Robin McKinley seems to have a knack for drawing the reader into her world :). Thank you letting me know about the ending! It is going on my TBR list, just not a purchase yet. 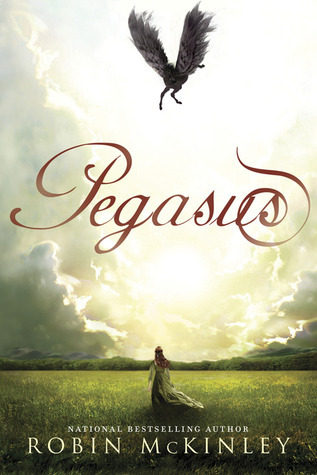 “Pegasus” is on my wishlist but I think I will wait some more time to read it because I dislike cliffhangers and want to have the next book in the series to read on. Glad to hear this book is good. I just bought but now I need to read it. Thanks for your review. This book looks amazing! Great review! I am glad to know this is a series. I had no idea. I’ve only read one McKinley book and I feel like even when she has action it’s slow. I’ll wait closer to publication of the next book before I read this one. I’m not a patient person when it comes to that! Good review. I read this one recently, and I was shocked by the ending at first–I hadn’t known it was part of a series until I looked it up. I haven’t read any of her books, but definitely want to soon.